Stereolithographic model of the Tyrolean Iceman. 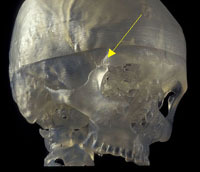 Anatomical features such as deformations due to the ice pressure or fractures (arrow) can be studied without harming the precious mummy. As early as 1902, only seven years after Roentgen's original discovery, Gorjanovic-Kramberger used radiographs to analyze internal features of fossil hominids. He started describing a frontal bone and teeth of the Krapina Neanderthals and little later came up with a description of a new diagnostic feature, taurodonty, by using x-rays (Gorjanovic-Kramberger, 1902, 1906). The introduction of Computed Tomography (Hounsfield, 1973) ultimately opened a new dimension for anthropology. For example, features of the temporal bones of fossils (Wind 1984; Zonneveld and Wind 1985), and postcranial elements (Jungers und Minns 1979; Senut 1985) were investigated. Conroy and Vannier (1987, 1988) also pioneered applications in anthropology by analyzing CT scans of the famous Taung child ( Australopithecus africanus ), concluding that it shows important dental maturational affinities with great apes. This in turn contributed to a new assessment of the individual age of this sole juvenile specimen of A. africanus . For studies of bipedalism, the shape and orientation of the inner ear is an important source of information. Spoor et al. (1994) showed that compared to recent apes and Australopithecines, the genus Homo is characterized by a suite of distinct features concerning the size and orientation of the semicircular canals. In 1996, Hublin et al. extended this reasoning to the use of inner ear morphology as a Neanderthal diagnostic feature. These examples are deal only with dried skeletal material, but exposing features of soft tissue in relation to the underlying bones is as well a major concern of anthropological research on non-fossil material. In 1992 for instance, Seidler et al. published a paper on the famous Tyrolean Ice Man, one of the world's best preserved mummies. With the help of a CT scan and the building of the worldwide first stereolithographic model in anthropology, the Iceman's skull could be virtually extracted for examination without harming the precious body. Since then, numerous mummies from Peru, Egypt, Siberia and other locations have been digitized, virtually unwrapped and described.